[Spears sent me this one. This is fascinating. Most people don’t seem to have an idea of what real leaders and great generals actually looked like. They aren’t necessarily handsome. In this case, a birth problem may have affected the size of his head. One friend of mine has a theory that we’re ruled by people with big heads, and this new sculpture of Caesar would certainly fit his theory!! All that matters is that the work must be accurate. This then would be the face of one of the greatest white men who ever lived. His feats were incredible. The Romans were used to doing amazing stuff, but his feats exceeded even those! He was a true warrior and a great leader whom men died for willingly. You don’t get that kind of loyalty without extreme ability. In that sense, Caesar and Napoleon are identical. You’re looking at the face of one of the greatest military minds of all time. The scientist says that Caesar was about corpses – and indeed that is true! The Romans were a white people who killed their enemies by the million even though they only had swords, spears and a few other devices! They created a civilisation that was 1,000 years ahead of the rest of Europe! We must become like them again! That is what Hitler was trying to do. WHITE WARRIORS create CIVILISATIONS! 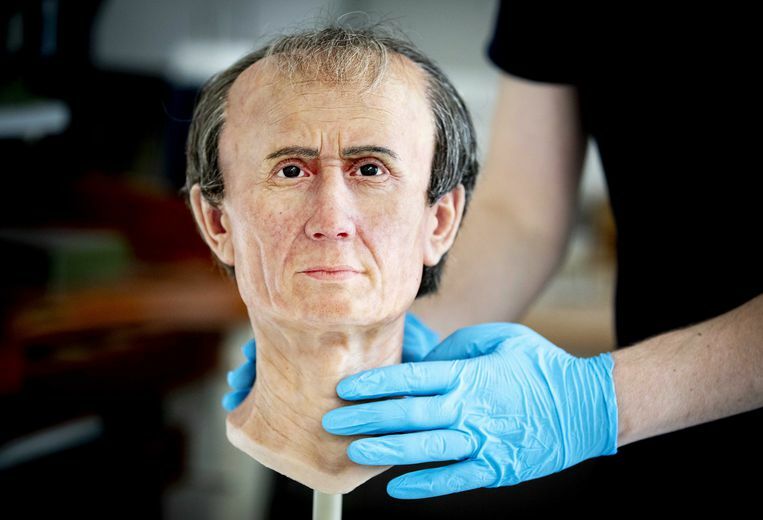 Julius Caesar, the reviled and revered Roman emperor, has gotten a new look, thanks to a recent 3D reconstruction of his face and head. The National Museum of Antiquities in the Netherlands unveiled the new bust Friday, giving viewers a fascinating image of what Caesar would have looked like in real life — complete with a huge bump covering part of his head. “So he has a crazy bulge on his head,” said physical anthropologist Maja d’Hollosy, the person behind the reconstruction, according to Dutch newspaper, HLN. The reconstruction was made on the basis of a 3D scan of a marble portrait in the museum’s collection. The museum said the 3D reconstrcution will be on display until the end of August. 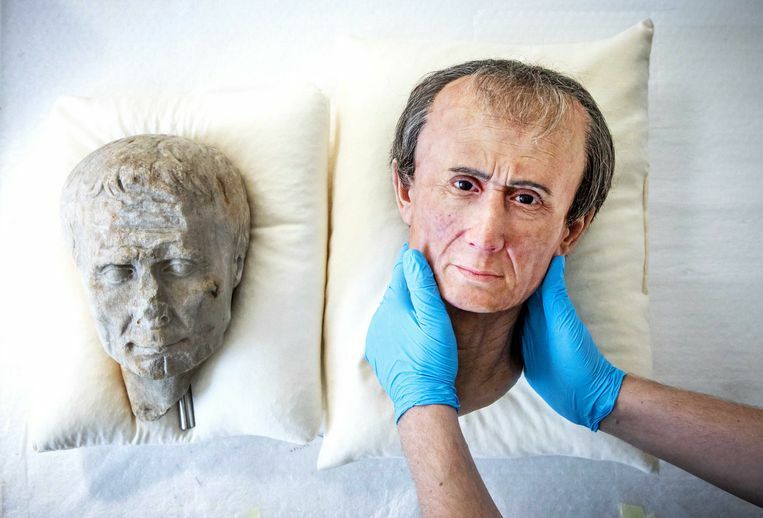 The Roman ruler Julius Caesar, murdered on March 15 of the year 44 BC, has a new face. Physical anthropologist Maja d’Hollosy made it for the National Museum of Antiquities in Leiden, where it is unveiled today and can still be seen for free. The bust was the idea of ​​archaeologist Tom Buijtendorp, whose book “Caesar in the Low Countries” was published at the same time. D’Hollosy used, among other things, his research results that have now been published. She went on for the face of Caesar further from two busts, one from Leiden and one from Turin, and from coins with Caesar from his own time. Especially the head in Turin seems certain that it is made alive and reasonably realistic, says Buijtendorp. “So he has a crazy bulge on his head. A doctor said that such a thing occurs in a heavy delivery. You do not invent that as an artist. And realistic portraits were in fashion “. The image in Leiden is very similar to that in Turin, although the most powerful man of his time lost a piece of his forehead, mouth and nose. D’Hollosy made a 3d print of the head from Leiden. There she took off the top layer and then applied a new one, using clay and silicone rubber. That way Julius got a lifelike face. “I do not let him look happy and friendly. He was a general who was about corpses, “says d’Hollosy. ← Video: Sweden designed the world’s strangest tank: Did they learn something from the Germans in WW2? Video: Why is there so much controversy around the Jews?